DREAM IT. GRASP IT. BUILD IT. AN EXPANDED AND BEAUTIFIED BEIT KNESSET, designed with high ceilings, maximum natural light, excellent acoustics and a large stage, will foster inspired tefila and be conducive to communal learning, gathering and celebration. 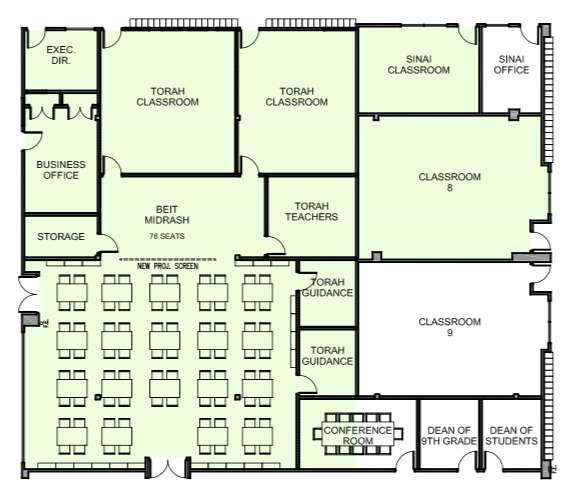 AN ENLARGED, CENTRALLY LOCATED BEIT MIDRASH will serve as a focal point of Torah study and will significantly enhance our existing culture of chavruta study. A LIBRARY/MEDIA CENTER, equipped with a full-time research specialist, cutting-edge hardware and software, and a full complement of books and online databases, will create an atmosphere conducive to collaboration and interdisciplinary exploration. AN EXPANDED LEARNING CENTER, designed with a large work area surrounded by smaller alcoves, will be ideal for offering multiple, simultaneously-run individual and/or small-group skill-building classes. In addition, placement of our expanded Learning Center in close proximity to our library/media hub will afford easy access to abundant educational technology tools aimed at reinforcing skill acquisition. DEDICATED SPACES FOR FINE ARTS CLASSES AND PROGRAMMING, including art, music, performance, dance, and culinary arts, will allow for the cultivation of creative expression that intrinsically fosters reflection, self-criticism, experimentation, persistence, and even playfulness — important skills in and of themselves, but crucial for maximal success in a competitive and sophisticated workforce. ADDITIONAL SCIENCE & STEAM LAB SPACES are needed to support our award-winning STEAM program. As our school grows, so does our need for additional science and STEAM lab spaces that support experimentation and project-based learning. Four gathering spaces, each large enough to comfortably accommodate an entire grade, allowing for programming that relies upon simultaneous full-grade gatherings. Multipurpose room/cafeteria large enough to comfortably accommodate the entire student body. Additional student lounge facilities with a 2nd-floor outdoor patio. An expandable communal space, outfitted with a stage and designed with excellent acoustics, large enough to accommodate over 700 people. Copyright 2018. A Josh the Web Man Production.